Kidrobot rounds its week of exclusive drops with Friday’s (12.7, 9 AM PST ) Watchparts Dunnys S4 release from Dan Tanenbaum. For the new series, Tanenbaum has added a burst of color—with what appear to be custom-sewn outfits— to his intricately encrusted designs featuring thousands of teeny, tiny watch parts. 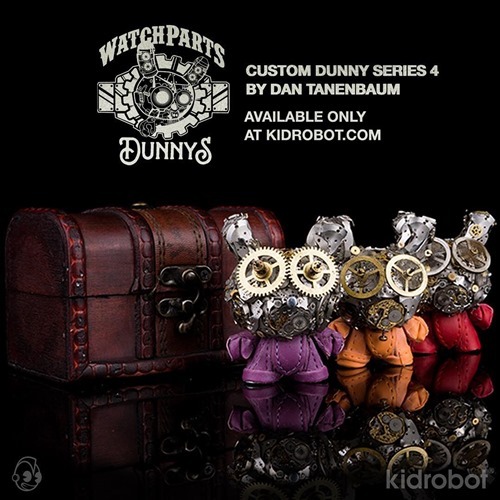 As with prior series, we expect dazzingly complex customs across all the Dunny sizes—3”, 5”, 8” and 20”. Pick your poison, so long as it’s pink. Baphomaniac returns from Martin Ontiveros and Toy Art Gallery with the new Pink Poison edition. Cast in hot pink soft vinyl, this factory-painted design brings together purple and silver sprays with a few accent colors as well. Pink Poison drops this Friday (12.7) at 12 PM PST for $85 from the TAG web shop. As a sweet holiday bonus, it includes a free Baphomaniac pin. 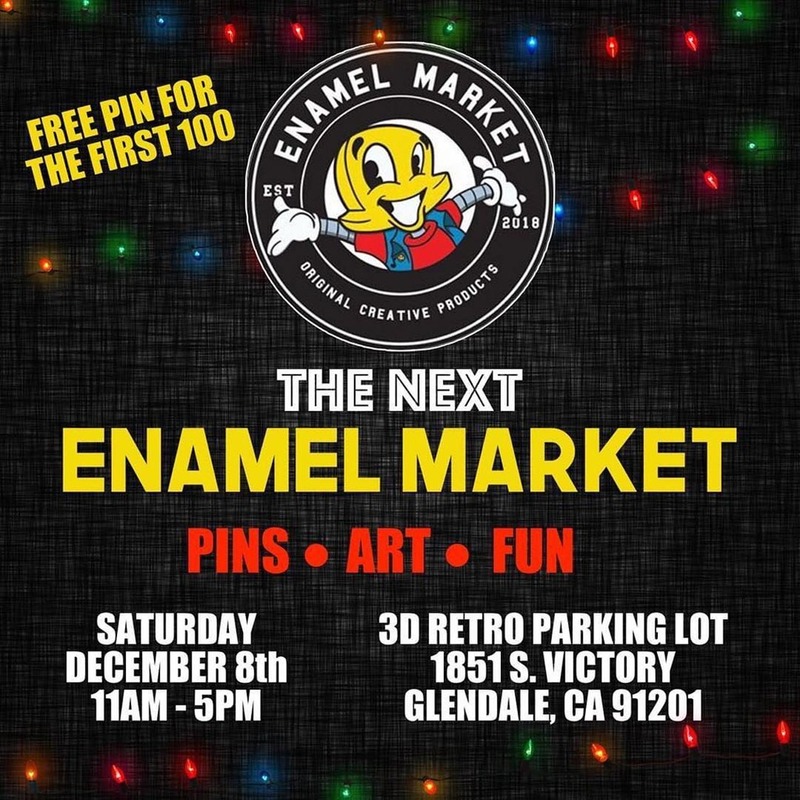 Enamel Market returns on Saturday (12.8) from 11AM to 5 PM in Glendale at 3DRetro (parking lot). Just in time for holiday shopping, the event is the perfect place to find stocking stuffers—pins, patches, and more—from a wide variety of indie artists and brands. As always, the first 100 attendees will get a free Enamel Market pin. Also, 3DRetro will be releasing the Lava Edition of the Jurassic Park Dilophosaurus Spitter vinyl toy by Joe Ledbetter starting at 11 AM with a signing from 6 to 9 PM. For their Countdown to Christmas, 3DRetro will be releasing a new Medicom exclusive toy every weekday until Christmas. Without doing the math, we’ll say that’s quite a few toys! If you weren’t able to make DesignerCon, this is your chance to pick up the exclusives you missed. 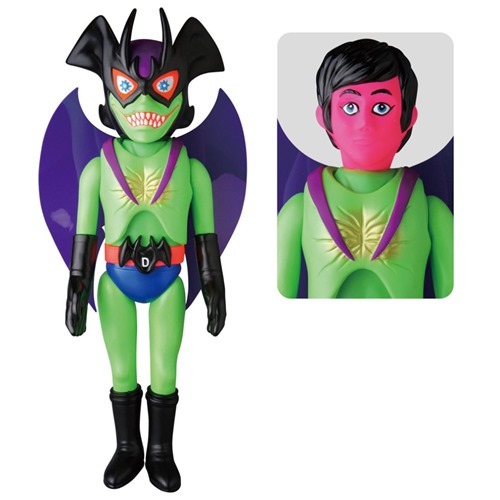 First up is Devilman The Birth, Japanese artist Shlelterbank’s interpretation of Go Nagai’s legendary character, in the DCon exclusive colorway. The 14” vinyl figure is available now for $264.99 from 3DRetro. Possessed CMY from Luke Chueh and Munky King drops this Friday in three retailer exclusive editions. Inspired by the CMYK color space used by Luke in his graphic design training, the series includes Cyan available exclusively from I Am Retro, Magenta available exclusively from Munky King and Yellow from MSX (China)—chosen by Luke for the humorous color synergy. Each of the three editions is limited to 200 pieces and will drop at 12 PM PST / 3PM EST on Friday (12.7) for $90 each. MSX will be accepting orders strictly through email at [email protected]. As sharp as each looks individually, they look terrific as a group. So… as they say… Gotta collect ‘em all! ToyZeroPlus’s Toy Soul lineup will feature a rather cute UFO. 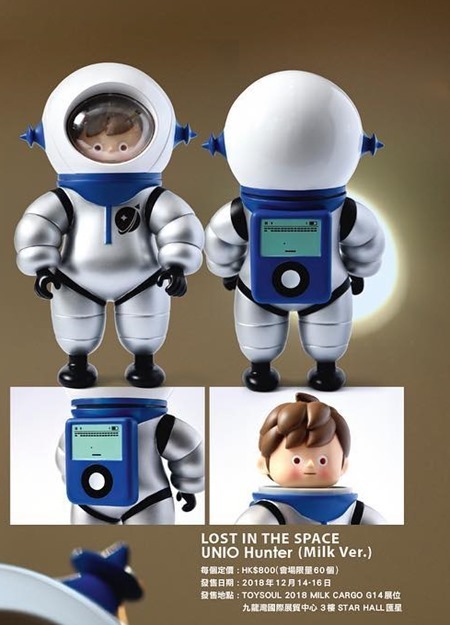 Miwu Fly M45 from Burning Monster is star-bound Miwu’s first adventure in soft vinyl and debut figure with Toy0+. Rendered in soft pink + blue pastels, the 2-piece set features Miwu and her spaceship. 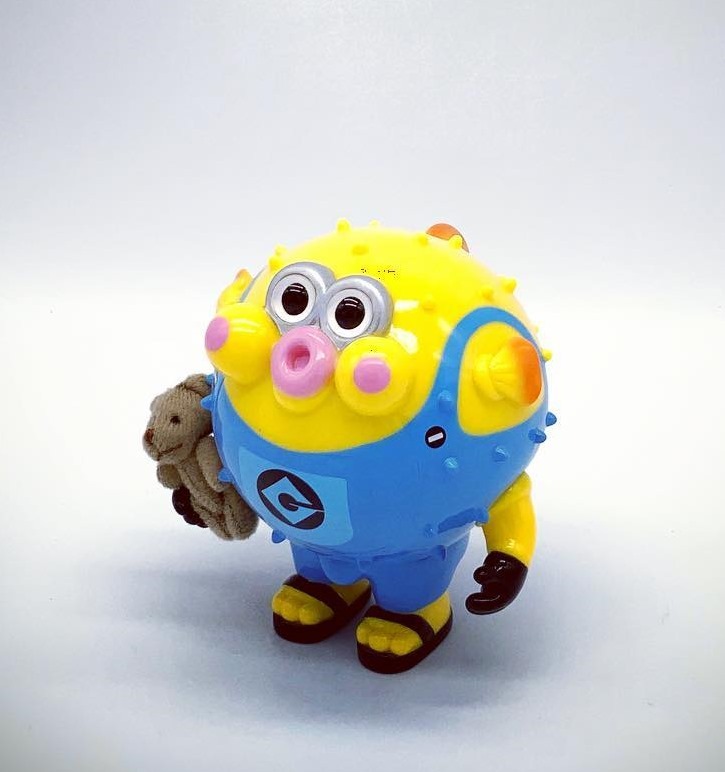 It will be available from the Toy0+ booth [E07]. Burning Monster has released several versions of Miwu in the past. The new soft vinyl design follows a previous in-flight design which featured a transparent cone to allow her legs to dangle below the spaceship. 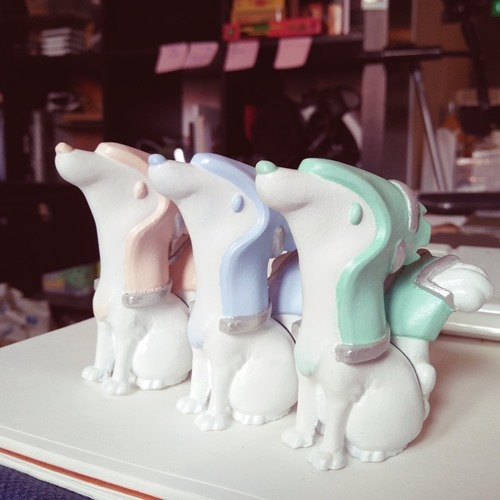 Singaporean artist Trivia Goh (Trivialities) has just released her Sweet Nweets resins in new pastel colors. The pup is available in Peach, Ice and Mint micro-runs of just 3 pieces each. The Sweet Nweets design features an alert pose and stylized gear. The hand-painted figures stand 2.75” tall and are available for $50 each from the Trivialities online store. In a pleasant surprise, Daydream Nimbus AKC Black(2.5”) has shown up for pre-order a bit earlier than expected. The newest edition in the AKC (American Kennel Club) series from Paulus Hyu and Kurobokan features a nearly all-black design except for the eyes and cute pink ears. 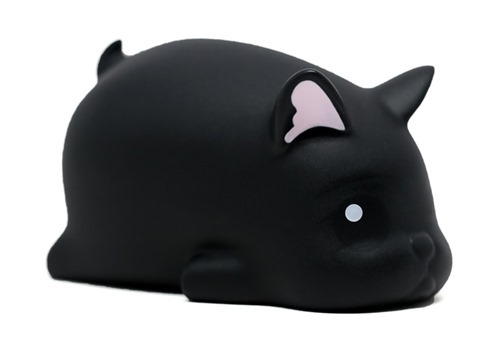 The AKC Black vinyl toy is available for $39.99 from myplasticheart and Strangecat Toys in the USA as well as other retailers globally. 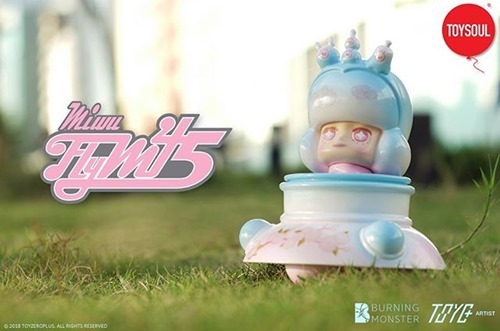 It follows the debut AKC Cream edition which was an Action City exclusive for STGCC.